Despite the fact that the EUR/USD currency pair is moving upwards right now, our expectations are still bearish. Earlier the price rebounded from the level of 50%, which means that it may start a correction, at least. The target are is the level of 1.2850, where there are several fibo-levels. At the H1 chart, the price reached the level of 78.6% and right now the bears are trying to make a reverse. Most likely, the market will continue falling down during Thursday. According to the analysis of temporary fibo-zones, predicted levels may be reached by the end of the week. A local correction reached the level of 50%. If the pair rebounds from it, the price will start a new ascending movement. 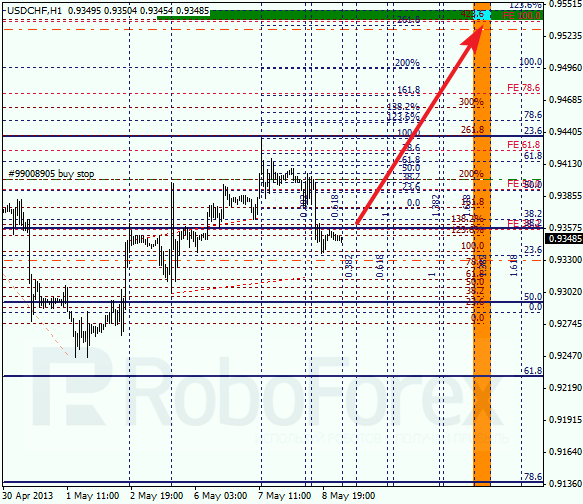 The target for the buyers the next several days is the level of 0.9535, where there are three fibo-levels. At the H1 chart we can see, that the bears started a correction, but they are unlikely to stay strong enough to continue pushing the price downwards. According to the analysis of temporary fibo-zones, predicted levels may be reached by Friday. Later these levels may become a starting point of a new correction.